Rates are based on groups of 45 or more people. Add $10.00 per person for reservations less than 45 people. For groups less than 35 people add $20.00 per person. Groups less than 30 people add $25.00 per person. Make checks or Money Orders to Ski Time Tours Inc.
Insurance: Optional trip cancellation, accident, health and baggage insurance is available to protect participants against unforeseen circumstances. 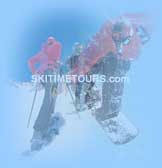 Upon request, Ski Time Tours will provide information and rates. As the Catskills' premier winter resort destination, Hunter Mountain boasts renowned terrain for all abilities, an impressive vertical drop, and some of the most reliable snow conditions in the East! 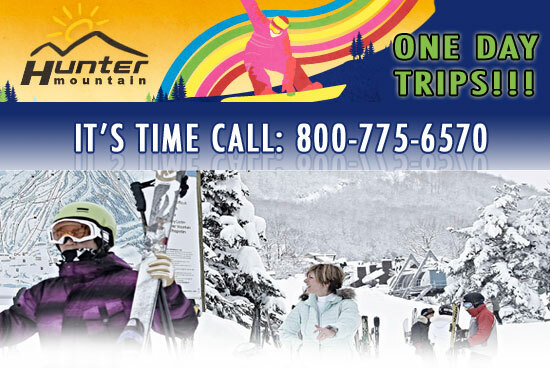 Hunter Mountain is open every day of the snowsports season from 8:30am to 4:00pm. Check our Snow Report page for currently open lifts and trails.